Marsh, James H.. "Remembrance Day in Canada". The Canadian Encyclopedia, 03 October 2018, Historica Canada. https://www.thecanadianencyclopedia.ca/en/article/remembrance-day. Accessed 19 April 2019. Remembrance Day is a yearly memorial day that is observed in many Commonwealth countries, including Canada, to remember those who died in military service, and honour those who served in wartime. It is observed across Canada each year on 11 November — the anniversary of the Armistice agreement of 1918 that ended the First World War. On Remembrance Day, public ceremonies and church services often include the playing of “Last Post,” a reading of the fourth stanza of the poem “For the Fallen,” and two minutes of silence at 11 a.m. Wreaths are laid at local war memorials and assemblies are held in schools. The red poppy is a symbol of Remembrance Day that was inspired by the poem “In Flanders Fields,” written by Lieutenant-Colonel John McCrae. Red poppy pins are sold by the Royal Canadian Legion and worn by millions of Canadians in the weeks leading up to and on 11 November. Canadians memorialized fallen soldiers on Decoration Day and Paardeberg Day for many years before Remembrance Day was first observed as Armistice Day in 1919. In 1890, veterans of the Battle of Ridgeway (2 June 1866) held a protest at the Canadian Volunteers Monument at Queen’s Park, in Toronto, by laying flowers at the foot of the monument on the 24th anniversary of the battle. The history of the Battle of Ridgeway was muted in Canadian military heritage and history, and the Canadian government	had been reluctant to acknowledge the veterans of the battle. About 850 Canadian soldiers clashed with some 750 to 800 Irish-American Fenians at Ridgeway. Nine Canadians were killed in action and 33 were wounded (see also Fenian Raids). The veterans’ protest became an annual memorial event known as Decoration Day, when graves and monuments of Canadian soldiers were decorated in flowers. For the next 30 years, Decoration Day was one of Canada’s popular military memorial days, commemorated on the weekend nearest to 2 June. Remembering Canadians who died in the Battle of Ridgeway soon expanded to those killed during the North-West Resistance (1885), the South African War (1899–1902) and the First World War (1914–18). Before the First World War, Canadians honoured their overseas war dead on Paardeberg Day	— 27 February — the annual anniversary of the Battle of Paardeberg in 1900, during the South African War. The battle was Canada’s first foreign military victory. From 1901 until the outbreak of the First World War in 1914, people gathered in public squares in cities and towns across the country, around newly built South African War memorials, to commemorate their soldiers’ service in South Africa. Paardeberg Day, however, was less a sombre affair of remembrance than a victory celebration and an affirmation of English Canada’s loyal ties to the British Empire. The horror and mass slaughter of the First World War (1914–18) changed Canadian perceptions of war. Millions of people were killed at sea and on battlefields across Europe, including 61,000 Canadians. Although Canada fought on the winning side, celebration of victory was replaced by solemn commemoration, and a sense that the country owed a collective national debt to the ordinary soldiers, mostly young men, who had lost their lives in battle. This debt would be paid, in perpetuity by successive generations, by the simple act of remembering the soldiers’ sacrifice. In April 1919, after the First World War ended, Member of Parliament (MP) Isaac Pedlow introduced a motion in the House of Commons to institute an annual “Armistice Day” — to be held not on 11 November, but on the second Monday of November each year. Parliament was still deciding on a date for the commemoration when King George V sent out an appeal to the British Empire on 6 November 1919. He urged that the armistice that ended the fighting be marked by the suspension of all activities, and the observance of two minutes of silence, at exactly 11 a.m. on 11 November — the same day of the year and time the armistice had been signed in 1918. Canadians commemorated Armistice Day on 11 November in 1919 and 1920. Another MP, C.W. Dickie, moved to change the name from Armistice Day to Remembrance Day. This renaming placed the emphasis more upon the soldiers whose deaths were being remembered. Parliament adopted these resolutions as an amendment to the Armistice Day Act, and Canada held its first Remembrance Day by that name on 11 November 1931. The Holidays Act of 1970 and 1985 recognized it as a national holiday. In France and Belgium, 11 November is still observed as Armistice Day, while in Britain Remembrance Sunday is the second Sunday in November. In the United States, war veterans are also honoured on 11 November, known as Veterans Day. In Canada, Remembrance Day has proven to be a flexible and enduring term. It has grown to include the remembrance of war dead from the Second World War, the Korean War and the War in Afghanistan, as well as from peacekeeping missions and other international military engagements. In all, more than 1.6 million Canadians have served in Canada’s Armed Forces and more than 118,000 have died in foreign conflicts. The phrase “Lest we forget” is often used in remembrance ceremonies to caution against forgetting those who died in war. The line can be traced back to the Bible — as “Lest thou forget” in Deuteronomy 6:12 — but was written in its current form as a refrain in Rudyard Kipling’s poem “Recessional,” written about Queen Victoria’s Diamond Jubilee in 1897. The symbol of Remembrance Day is the red poppy, which grows on the First World War battlefields of Flanders (in Belgium) and northern France. The poppy as a symbol of death and renewal predates the First World War and dates back as far as the Napoleonic wars in the 19th century. The seeds of the flower may remain dormant in the earth for years, but they will blossom in abundance when the soil is disturbed. As the artillery barrages began to churn the earth in late 1914, the fields of Flanders and northern France saw scores of red poppies appear. Red Poppies in Flanders today. The poppy became a symbol of Remembrance Day thanks to the famous poem "In Flanders Fields," written by Canadian John McCrae (photo by Joseph Moore). The first person to use the poppy as a symbol of remembrance was Moina Michael, a member of the American Overseas YMCA, who had been inspired by Lieutenant-Colonel John McCrae’s poem “In Flanders Fields.” Michael pledged “always to wear a red poppy of Flanders Fields as a sign of remembrance and the emblem of ‘keeping the faith with all who died,’” referencing a line in the poem. On 9 November 1918, Michael shared her pledge with her colleagues, who asked to wear poppies along with her. The next day, she purchased 25 silk poppies with money given to her by YMCA employees for her work on a YMCA conference in New York City. She pinned one to her coat collar and gave the rest to her colleagues. Over the years, she worked to popularize the poppy as a symbol of remembrance. The National American Legion adopted the symbol at its conference in April 1920 after hearing Michael’s campaigning. Anne Guérin of France was inspired by the same campaign. She too had been touched by McCrae’s poem, and became a vigorous advocate of the red poppy. Guérin started the American and French Children’s League, which sold cloth poppies to raise money for people suffering in war-torn France, particularly orphaned children. In 1921, she travelled to Britain and Canada and persuaded both the British Legion and the Canadian Great War Veterans Association (a predecessor of the Royal Canadian Legion) to adopt the poppy as their symbol of remembrance as well. 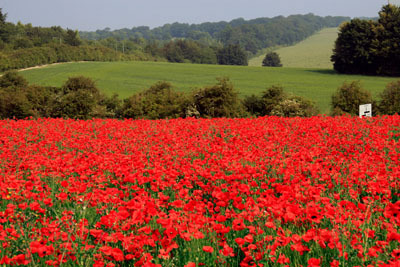 The first “poppy day” in both countries occurred on 11 November 1921. For the first year, artificial poppies were brought to Canada from Guérin’s organization in France. By 1922, lapel-worn poppies were manufactured and distributed by veterans in Canada. The Royal Canadian Legion, formed in 1925, has run the poppy fundraising campaign in Canada ever since. 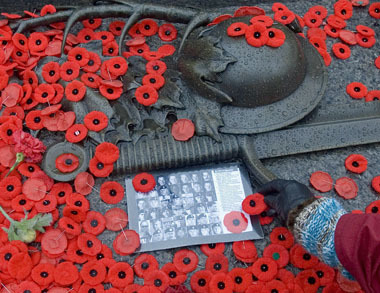 Today, millions of Canadians wear the bright red emblem as a symbol of remembrance, leading up to and on 11 November. They Poppy campaign raises funds to support veterans and their families. 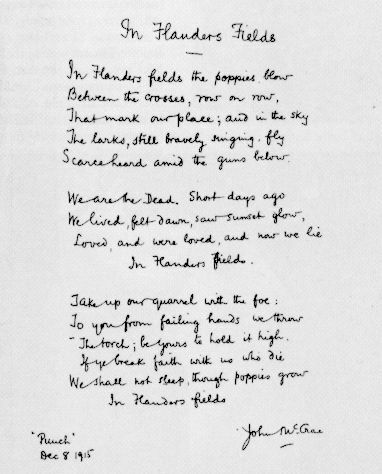 The poem “For the Fallen” was written by Laurence Binyon in 1914. After it was published, the fourth stanza became known as the “Ode of Remembrance” or the “Act of Remembrance.” Its lines are often engraved on cenotaphs, war memorials and headstones in war cemeteries throughout the English-speaking world. On Remembrance Day, public ceremonies and church services often include the playing of “Last Post” followed by “Reveille,” a reading of the fourth stanza of the poem “For the Fallen,” and two minutes of silence at 11 a.m. Wreaths are laid at local war memorials and assemblies are held in schools. 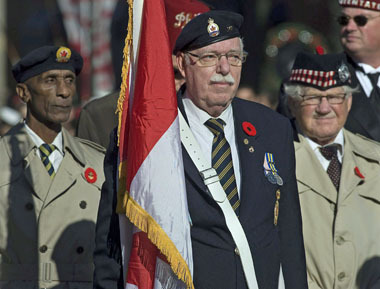 Veterans pay their respects as they attend Remembrance Day ceremonies in Halifax, 11 November 2010 (courtesy Canadian Press Images). “Last Post” was a military bugle call played at the end of the day to signal that sentry posts were manned and ready for the night ahead. In Remembrance Day ceremonies, the “Last Post” symbolizes death. It is followed by two minutes of silence, which are broken by the “Reveille” bugle call. “Reveille” was the first call sounded in the morning and symbolizes resurrection of the spirit of the fallen on Remembrance Day. The Books of Remembrance, which lie in the Memorial Chamber of the Peace Tower on Parliament Hill in Ottawa are another record of the wars. The eight books contain the names of more than 118,000 Canadians who have died on military service, or in the merchant marine. The various books cover foreign conflicts dating from the War of 1812, the South African War and Nile Expedition, through the world wars and Korea, to the conflicts of the 21st century. A separate Newfoundland Book of Remembrance includes the names of Newfoundlanders who died in the First and Second World Wars, when Newfoundland and Labrador was not yet part of Canada. Monuments commemorating the lives of Canadians who died in conflicts overseas occupy a prominent place in towns and cities throughout Canada. Most were erected in the 1920s and 1930s following the First World War (the names of subsequent wars were later added to many of these memorials). They represent a commitment, by communities large and small, not to forget Canadian lives lost in war (seeMonuments of the First and Second World Wars). Every year, the Royal Canadian Legion chooses the mother of an Armed Forces member killed in military service to represent the mothers of Canadian veterans. She is named the National Memorial (Silver) Cross Mother, and is invited to attend the national Remembrance Day ceremony in Ottawa. Canada’s most prominent domestic war monument is the National War Memorial in Ottawa, which is the focus, on 11 November, of a nationally televised Remembrance Day ceremony, traditionally attended by the governor general, the prime minister, senior Legion officials and a large parade of veterans. The Tomb of the Unknown Soldier is located at the foot of the National War Memorial (see Unknown Soldier). It contains the remains of an unidentified Canadian soldier killed in the First World War. His remains were exhumed from a cemetery near Vimy Ridge and repatriated in 2000. The tomb represents all Canadians killed overseas who lie in unmarked graves. Remembrance Day is a federal statutory holiday (a paid day off work for federal employees). It is also a statutory holiday in some but not all the provinces and territories. Heather Robertson, A Terrible Beauty, The Art of Canada at War (1977); Patricia Giesler, Valour Remembered: Canadians in Korea (1982); John McCrae, In Flanders Fields and Other Poems. Edited by Sir Andrew Macphail (1919); Jonathan F. W. Vance, Death So Noble: Memory, Meaning, and the First World War. The Royal Visit Check the 32 minute mark of this video to view the unveiling of the National War Memorial by King George VI and Queen Elizabeth in 1939. Tommy PrinceWatch the Heritage Minute about Tommy Prince, Canada’s most-decorated Aboriginal war veteran. From Historica Canada. Winnipeg FalconsWatch the Heritage Minute about Winnipeg Falcons hockey players who traded in their hockey sticks for rifles in the First War War. From Historica Canada. Guide to RemembranceThis teaching guide fosters the Tradition of Remembrance amongst Canada’s youth. From the Royal Canadian Legion. National War Memorial & the Tomb of the Unknown SoldierAn infographic about the historical significance of the National War Memorial in Ottawa. From Public Works and Government Services Canada. Tommy PrinceTommy Prince est l’ancien combattant autochtone le plus décoré. Par Historica Canada. Le Monument commémoratif de guerre du CanadaFaits intéressants au sujet du jour du Souvenir, du Monument commémoratif de guerre du Canada et de la Tombe du Soldat inconnu. Par le site Web de Travaux publics et Services gouvernementaux Canada. John McCrae's War: In Flanders FieldsA review of the documentary film "John McCrae's War: In Flanders Fields." From the Manitoba Library Association. Memorials to Canadians' Achievements and SacrificesAn illustrated guide to memorials erected by Canada throughout the world. From Veterans Affairs Canada. 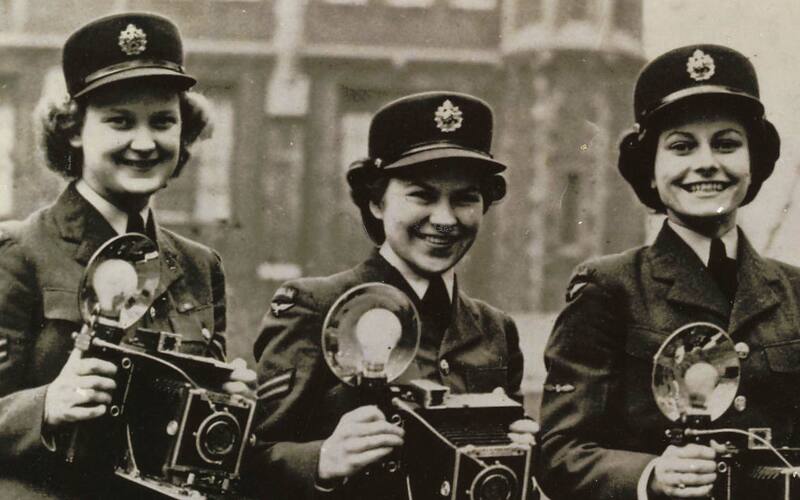 The Memory ProjectA diverse collection of online interviews featuring Canadian veterans' first-hand accounts of their military service during the Second World War and Korean War. See also related digitized artefacts and memorabilia. From Historica Canada.